The training event was organzied at Aro Palace, sala Europa III in Brasov, Romania from Asociatia MERGI INAINTE and with the participation of 51 local trainers and experts in Roma issues. The event was organized as part of ToT in educational and employment sector. The participnats in both topics were common. More information about the event is available HERE. ALDA (European Association for Local Agencies) organized in Strasbourg a training session about socio-economical insertion of Roma people. The training took place in the framework of the project PAL Fighting discrimination and anti-Gypsyism in education and employment in EU and the international Day of Rom people the day after, on the 8th of April. 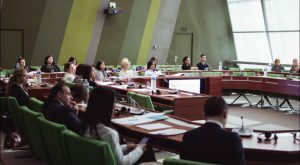 40 persons were present for this occasion: among other social workers, insertion companies, representatives of public authorities and civil society from the Region Alsace. The participants had the possibility to share their points of view in order to improve the networking, the referencing, the communication, and removing barriers to economical insertion for Rom people on the job market More information is available HERE. The meeting was implemented at the multi-purpose room of the Cultural Center of the Municipality of Thermi with 41 participants and organized through personal contacts as all participants were identified through the initial meetings with stakeholders at local level that were held at the start of the programm. The main thought was to give precedence to staff/officers who are currently employed in public and private institutions that provide services to Roma in the field of promoting Roma employment, and to Roma mediators in order to ensure that the added value of the training will have a direct positive impact on Roma.At the beginning of the training greetings were sent by Mr. Sokratis Samaras, President of Board of the Directors ANATOLIKI S.A., and Mrs Anna Michou, president of the Board of the “Social Welfare Centres – Care & Preschool Education of Municipality of Thermi”. More detailed information is availabel HERE. The event was organziued with the support of the national authorities at Sala del Ayuntamiento de Puerto Real with 31 participants each of the two days. More information is downloadable HERE. Workshop was organized at Spazio Culturale Rampa Prenestina – Via Aquilonia 52, Roma in order to enrich skills and competences of cultural mediators, trainers and teachers, social workers and consultants who work in the field of social inclusion of Roma people, paying a special attention to the issue of employment integration of Roam youngsters. The 22 participants were both Roma and non Roma experts, all involved in the field of job placement and personal development of Roma people. Workshop was carried out through simulation and peer-to-peer contents exchange, in order to test models and techniques of participatory planning and cooperative learning among the operators. In order to enhance the participation of experts was proceeded with online communication with 32 additional experts, who were shared the video of the training. The agenda of the training is avilable HERE. Small video of the event is shared HERE. All the information about the events can be found HERE. The event was organzied in Dům dětí a mládeže Kralupy nad Vltavou with the participation of 41 experts. The training was splited into two rooms. The projects and the topics were presented and explained with examples. Postive fefdback was reecievd from the participnats. All the information &documents are available HERE. Based on this information 115 experts have viewed the online training materials, giving final results of 124 trainers educated. The materials will be available till the end of the project. The training list is also available in Youtube list HERE. All the materials of SRDA work are availble HERE. In order to reach out to more people from Hungary over a longer period of time, our strategy was to create a pre-recorded online training. The training modules were adjusted to the Hungarian needs and recorded by local experts during the months of January and February 2017. The final version of the training course was published on 28th February 2017. Each video presentation is between 15-25 minutes and followed by a questionnaire to assess the understanding of participants. An email address is provided at the beginning of the training to address related questions and request certificates. Certificates are given out the participants who fully concluded the course, and answered 70% of the assessment questions correctly. Participants can return to each module to re-take the course. At the end of the course, participants are asked to evaluate the training, and each module. The training course will be available online at least until the end of Project PAL. Participants had to give their email addresses to access it, and could pause after each section, if they wanted to. Till the end of April 2017, 25 experts have participated in the online course. The training course can be accessed through the LINK. vAll the materials are available HERE.